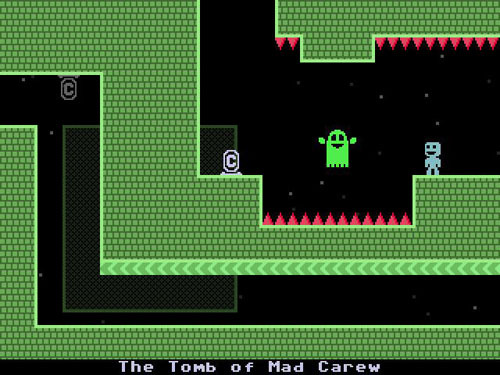 A game by Terry Cavanagh for PC, Mac, Linux, PS4, Vita, Switch, 3DS, Ouya, iOS, and Android, originally released in 2010. At the start of VVVVVV, Captain Viridian and his five V-named shipmates suddenly encounter some sort of interference that places the ship in peril. The crew heads for the teleporter to get away… but something goes wrong and everyone is sent to different locations. The player controls Viridian as he explores the world to find his crew and return them safely back aboard the vessel. The player has very limited controls. He can move left and right, and he can flip gravity. There is no jumping on platforms, no climbing ladders, no shooting guns, no collecting upgrades, and no gaining new abilities; there is only movement and gravity. As simple as these mechanics may sound, the entire game is built around this limited control scheme, and each of its challenges centers on using them in various creative ways. 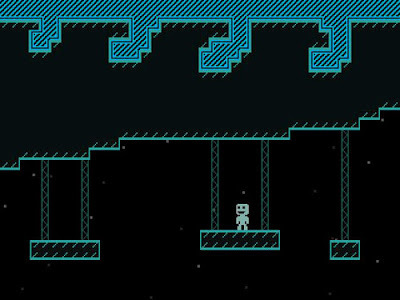 The biggest difference between VVVVVV and other platformers with gravity-based mechanics is the fact that there is no JUMP button. This forces the player to consider each environment differently, since Captain Viridian can’t just hop over a set of spikes; he instead has to hop up to the ceiling, walk over them, and then drop back down on the other side. Of course, you’ll seldom have it that easy, as precision gravity flipping is required in many areas, which will see you hopping up and down on narrow platforms between rows of spikes, riding moving platforms, and dodging odd-looking enemies as they move along their patrol routes. And, given the open world design, you’ll often need to be able to take the same path in reverse. Just as the player becomes accustomed to the basic use of gravity controls, new environmental conundrums present themselves. Tight enclosed areas require quick precise jumps, sometimes involving long falls across multiple screens while moving left and right to avoid spikes. Disappearing platforms require that the player be swift and precise, making multiple gravity flips before his footholds crumble. And forced scrolling areas require you to outthink an ever-moving row of spikes above and below the screen that spell your almost certain doom. There is also a special environmental obstacle – represented by a thin line – that automatically reverses your gravity when you touch it. Just like the M-308 Gunner in Metal Storm, Captain Viridian cannot perform midair gravity flips; rather he must flip gravity, find solid ground (or ceiling), and flip again. However, these thin lines force him into a midair flip. At first, the player will simply use these obstacles as a means to jump into the air and bounce back down (or up) onto a solid platform. But before long, the player will be required to make several sequential midair gravity flips as he moves between multiple horizontal lines that bounce him back and forth like a ping pong ball. Then, the player will encounter vertical lines that have the same effect, allowing for new situations where he must bounce around corners and up through narrow shafts in a fast and delicate gravity dance. Late in the game, you’ll discover environments that loop in on themselves (e.g., going off the left side of the screen brings you in on the right), forcing you to think about each level in a new way. Combined with the aforementioned gravity flipping lines, moving platforms, and patrolling enemies that can also wrap around the screen, the player will require a very tight focus on everything that’s happening if he hopes to be successful. Failure is fast and frequent, but there are loads of checkpoints to keep things from becoming overly frustrating, so the player will rarely lose much progress if he fails to overcome a particularly difficult challenge. 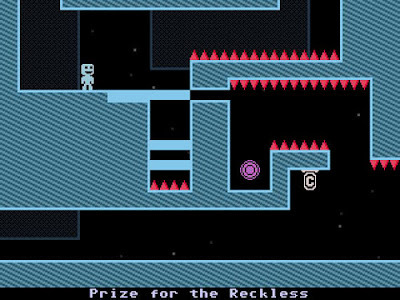 But for players who are looking for that sort of added challenge, VVVVVV has you covered. Spread throughout the world are a number of hidden “trinkets”. Some are fairly easy to obtain, others will require a reasonable mastery of the controls, and a couple are just downright devious in what they require of the player. Skilled and patient completionists will be rewarded with an additional sequence at the end of the game as well as a very challenging Super Gravitron minigame. 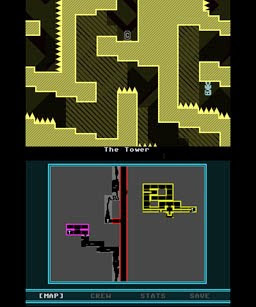 While VVVVVV is made up of interconnected single screen environments, the game world is quite large, and the player is essentially free to travel to any location he desires from the very start. As new areas are explored, they are marked off on the map, and most of the world is accessible from the start of the game. There are also a few computer terminals to be found throughout your adventure which will display remote locations on the map, offering a hint as to where your shipmates may be located. 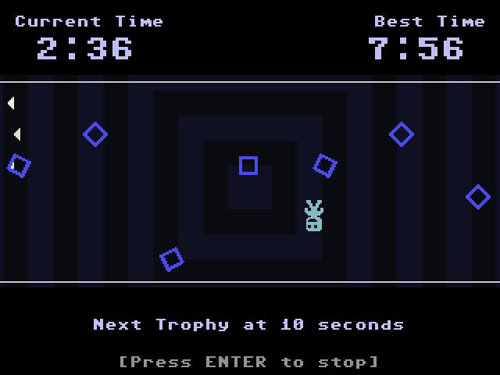 Aesthetically, the game carries a strong C64 influence with transparent single-colored characters and enemies, brightly colored environments, and a low resolution. The retro stylings are further emphasized by the chiptune soundtrack by Magnus “Souleye” Pålsson, who previously worked on Space Phallus and several other titles. The game is also punctuated with bits of humor, with some interesting room names and static enemies in a variety of ludicrous shapes. 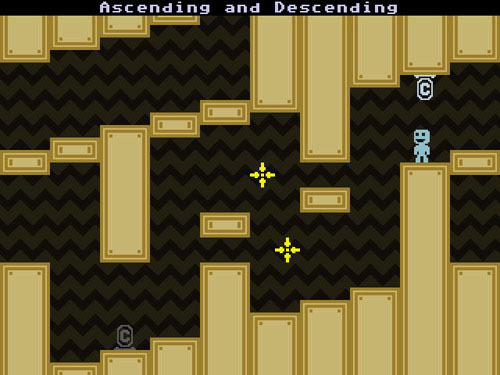 In addition to the main game, there is also a level creator that allows players to try their hands at creating an entire VVVVVV world of their own (note: the level editor is not included with the 3DS version of the game). Included in the download are several custom levels created by other indie game developers including Markus “Notch” Persson (Minecraft), Craig Forrester of Ishisoft (Treasure Treasure: Fortress Forage), and Jonathan Whiting. VVVVVV was originally designed by Terry Cavanagh as a Flash-based game in 2010, but saw a full downloadable release as a PC, Mac, and Linux title in 2011 when it was ported by Simon Roth. Terry Cavanagh is an Irish developer living in England who is known for releasing a number of freeware titles, mini games, and short experimental pieces that focus on using gaming as a storytelling medium. VVVVVV was his first commercial release. 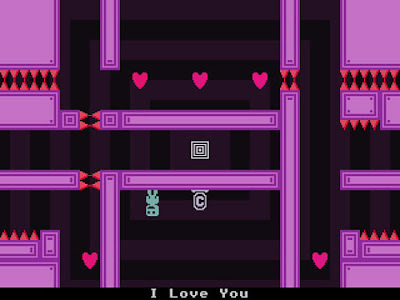 VVVVVV was published for the 3DS on Nintendo’s eShop in 2012 by Nicalis, who was also the publisher for Cave Story+, La-Mulana, Castle in the Darkness, and Save me Mr Tako: Tasukete Tako-San. The main game has the same content as the PC version, with the addition of a map that is always viewable on the second screen of the 3DS. The game lacks a level editor, and has some timed exclusive custom levels that are different than those available on PC. One of the most fun indie game out there. Sometimes it is a bit frustrating though especially when collecting those shiny trinkets (Veni Vidi Vici, I'm looking at you) but I often got some sense of accomplishment when finishing it and it's worth it. Veni Vidi Vici is indeed one of the most dastardly designed trinket runs in the game. First you question the sanity of the developer for creating it... and then your own sanity for continuing to try against all odds to get it. Edge Games and Prize for the Reckless were pretty tough too.